World Polio Day is today, October 24, 2017. It is a global effort to eliminate the last 0.1% of polio cases, and today we celebrate the progress over the past year. Blue Raster participates in the fight by supporting the World Health Organization’s (WHO) Global Polio Eradication Initiative. 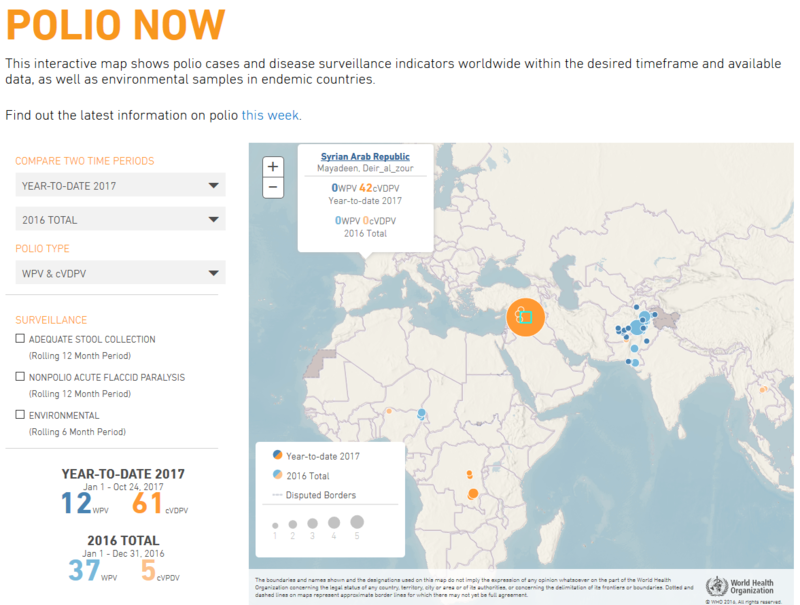 We maintain WHO’s Polio Now interactive web map of polio cases and disease surveillance indicators. Pakistan, Afghanistan and Nigeria are the last three countries in the world that still have cases of wild poliovirus (WPV) transmission. The remaining cases are caused by circulating vaccine-derived polio (cVDPV2). This type of polio originates from the attenuated polio virus administered as an oral vaccine that has survived, mutated, and gets transmitted from person to person in under immunized populations. This map captures the cases of WPV and cVDPV and also displays the surveillance efforts in each country. To learn more about the successes of Global Polio Eradication Initiative over the past year and how you can support this effort, please visit their website at www.polioeradication.org.